Leather care is an important part of vehicle maintenance. Proper leather cleaning and conditioning will not only maintain the look of your seats, but also the durability and comfort! Below, you’ll find a few quick tips from The Seat Shop on how to care for your leather seats. Firstly, you’ll want to stay away from cleaning solutions with harsh chemicals. However, if it’s been a while since you’ve cleaned your seats, you’ll need to roll up your sleeves and do some work. For a deep clean, we recommend Chamberlain’s Straight Cleaner #2. 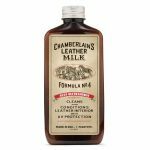 This product permeates leather with natural, non-alkaline cleaning agents and alcohols, gently removing substances that damage leather. Remember, this is just a cleaning product, so don’t forget to condition the leather afterward! Conditioning is going to keep your leather soft. Without regular conditioning, the leather will dry out, crease and crack. Chamberlain’s Auto Refreshener #4 is the perfect solution to this problem. It contains a cleaner, so you can also use it on a regular basis! In addition, it will condition the leather with nutrients and UV protectants. It can be used on both leather and vinyl, and will go a long way toward extending the life of your seats! Below, you’ll find a quick video that demonstrates the capability of Chamberlain’s products. Interested in learning more? Check out our website, sign up for our Newsletter, or just give us a call at (214) 710-2565! We’re always happy to talk with you about your seats.